I’m excited to participate in another Create and Share with my talented friends. This time around we all started with the same plain wood tray to create with! If you are interested in the tray, you can find it HERE (This is an affiliate link!). As soon as our lovely hostess Stephanie, from Casa Watkins, suggested this tray, I knew exactly what I wanted to do with it. I’ve been eyeing beautiful faux and real living wall art pieces on Pinterest for a while. Since supplies are a little hard to come by on this island (unless you know Japanese! ), I only used items I had on hand. If you use the same tray we did, it needs a light sanding. Spray paint with white paint paying special attention to the sides. Once the white paint is dry, tape off the edges and spray paint or hand paint a darker color inside. I had a sample jar of teal paint left over from my kitchen table makeover, so I used that. The tray actually looked really pretty white and teal but I wanted to have fun with it! To make felt rosettes, cut a square spiral in a piece of felt. (You can also cut a round spiral if your felt is round.) Start from the center of the spiral and roll. Place a little bit of hot glue on the end to hold into place. After your rosettes are formed (I created about 20), arrange them around the moss rocks in the tray. Hot glue into place. This makes an inexpensive backdrop for the lovely succulents. Place your succulents or other plants in place. Time to hot glue again. Watch those fingers! I’m super happy that I didn’t have to make a trip to the store for supplies for this project. If I ever get tired of it, I can always pull out the “plants” and peel off the hot glue to have a pretty teal and white functional tray. Right now, I’m loving it! It looks great in our eclectic foyer. Now it’s time to see what the other talented bloggers did with their trays!! You can find other Create and Share posts HERE and HERE. 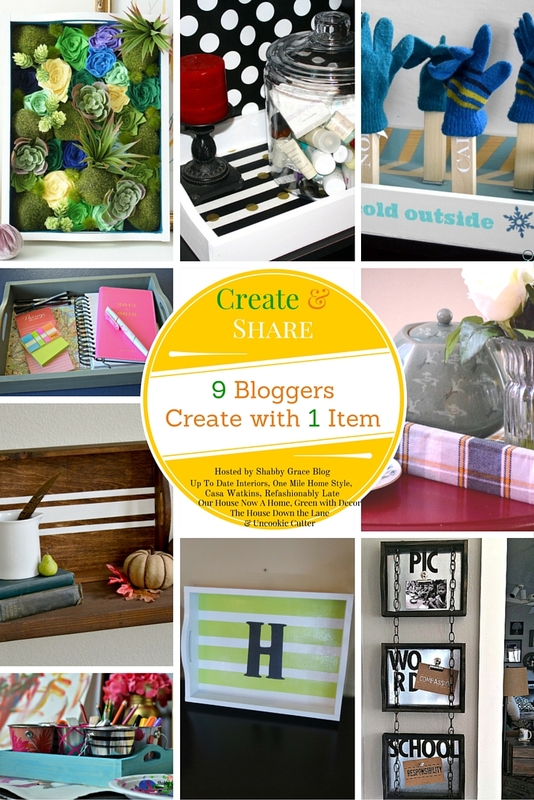 Don’t forget, there’s a blog hop of 20 bloggers showcasing their Home Styles!! There are some new tours today and then the rest of the ladies will be sharing tomorrow. Kathy I LOVE THIS! What a great idea and I love how it’s a statement piece in your home! I want to make those little felt flowers now! Hi, Kathy ~ This tray looks absolutely beautiful! And I love those felt flowers. :0) The tray looks great in your foyer, and I’ll bet you’ll have some conversations with guests. This is gorgeous! I adore all of the green colors! Those flowers are great! Wow! So creative and beautiful. I would have NEVER thought to do this!!!! This is amazing!! I love love love it! I, too, love just the plain white and teal tray. This is so creative :). Thanks for sharing! How creative! I love how you did the felt flowers. Beautiful job! Thanks Meghan! The felt flowers were super easy. Love how creative and unique this is. I kind of don’t even have words to describe how much I love it because it’s so cool and I’ve never seen anything like it. 🙂 Pinning away! Another great project. Thanks for the kind words and sharing Sam! This is such a fun idea! And those felt succulents are so neat, I am going to have to give them a try! Thanks Stephanie! They are fun to make. Kathy this is so awesome! I love the art work and it was such a creative twist to the challenge. Pinned and shared. Thanks for participating in the create and share this month!